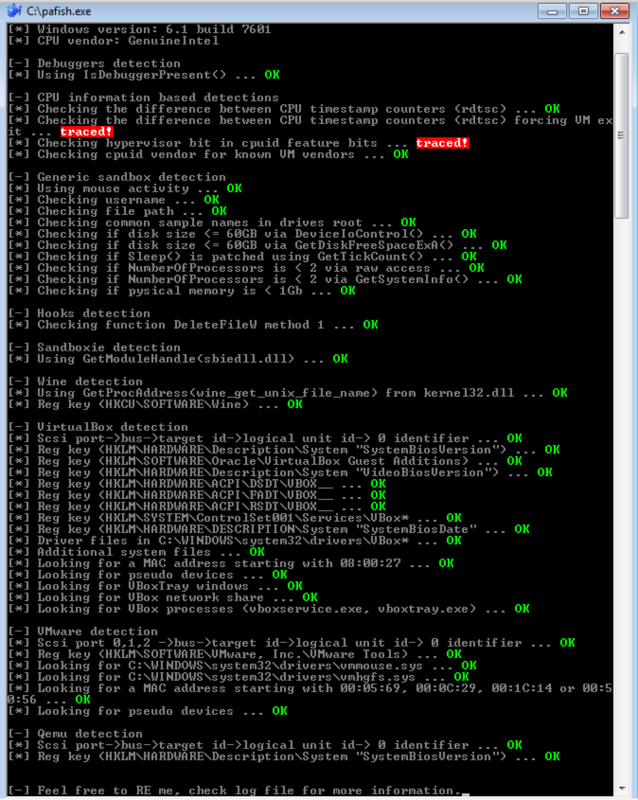 This is another post related to malware analysis and QEMU/KVM. I did a bit more research and found different older articles describing how to make pafish happy and how to evade malware that are aware of virtual machines. 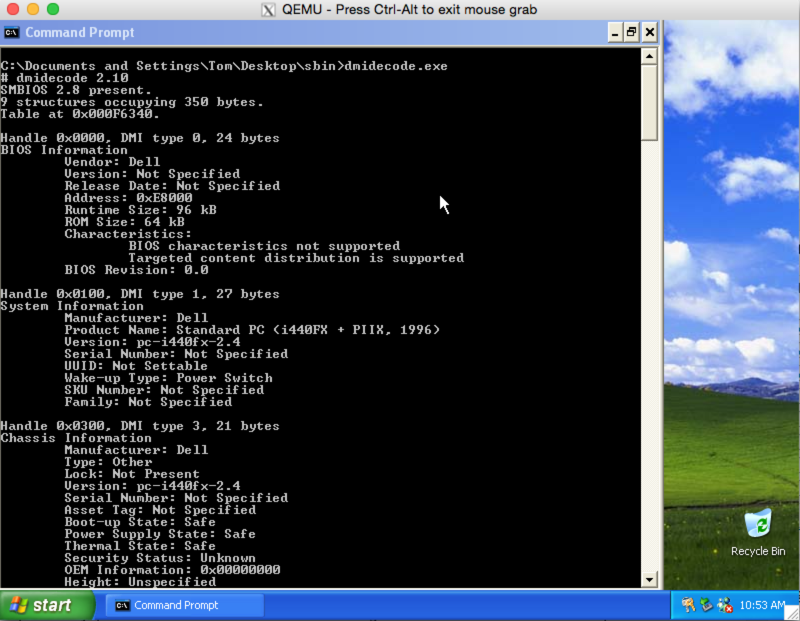 Below is a screenshot from the output of pafish on Windows 7. 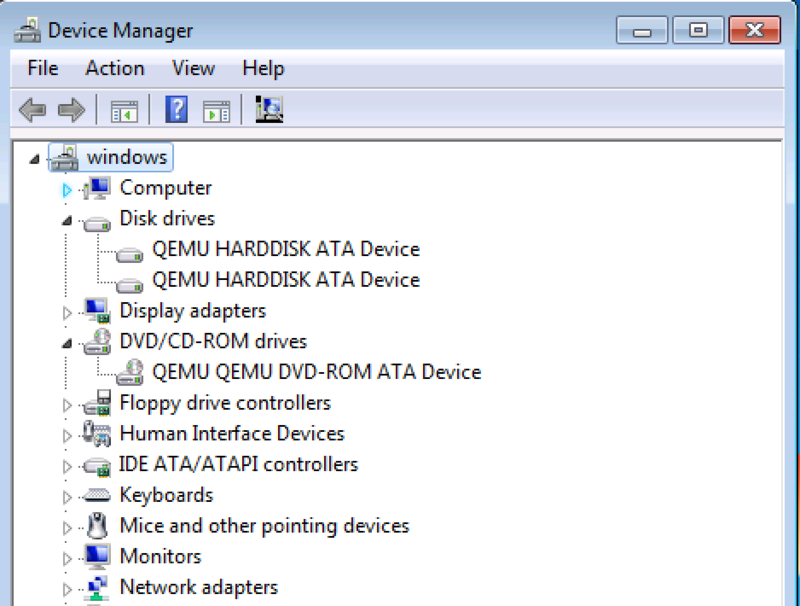 As you can see there are devices called QEMU which indicates that this is not a laptop. Note that pafish did not detect this, but still, we should fix it. Our goal today is to make it say something else. Before we continue there are a lot of posts that I have used for reference (Check the end of this guide), but I wanted to start fresh and make a guide for everyone trying to do this on.. You guessed it, CentOS 7. Also, make sure that you have the kvm module loaded. My laptop for this guide is an old laptop running a AMD CPU. Check with lsmod if the proper modules are loaded. For intel it should say kvm_intel. 1. Install a fresh CentOS 7 minimal. Grab a coffee while you wait. yum install python-devel perl-XML-XPath supermin python-ipaddr libvirt-python yum groupinstall "Development Tools"
This would give me the value of “make -j2”. Yea, this is an old laptop.. These are the files that you need to edit. I will replace it with “WDC WD20EARS” that should simulate a 2TB disk from Western Digital (according to a Google search). Time to build! Make sure you are root so you can install it. Fix a sympbolic link to make virt-manager happy. Jun 26 08:32:07 localhost systemd: Started Virtualization daemon. You can now start virt-manager by executing ./virt-manager in the same directory. Or, if you do not want to use virt-manager and create the virtual machine, you can just continue to step 7. Each time you want to modify something in the qemu code you can just rerun the make and make install steps and you will update the binary and drivers will be changed accordingly. This is the last step if you really would like to be sneaky. 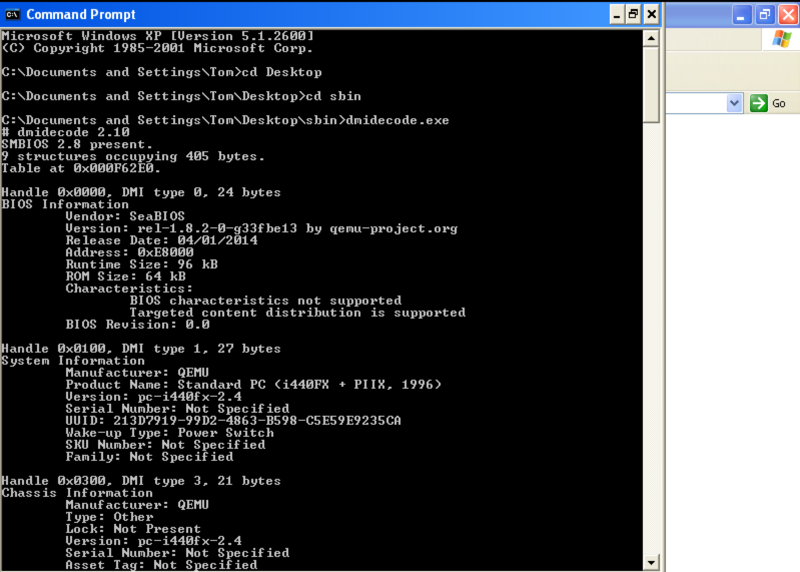 When you execute dmidecode it will also tell you that this is QEMU and not something else. QEMU uses seabios so we will start by performing a clone of the latest source and compile it. /usr/libexec/qemu-kvm -enable-kvm -m 1024 -drive file=/vm/winxp.qcow2,if=none,id=drive-ide0-0-0,format=qcow2 -device ide-hd,bus=ide.0,unit=0,drive=drive-ide0-0-0,id=ide0-0-0,bootindex=1 -k en -boot n -bios /root/bios/seabios/out/bios.bin -smbios type=1,manufacturer="Dell" -smbios type=0,vendor="Dell" -smbios type=4,manufacturer="Dell" -smbios type=17,manufacturer="Dell" -smbios type=3,manufacturer="Dell"
This is where I specify the bios file we compiled. 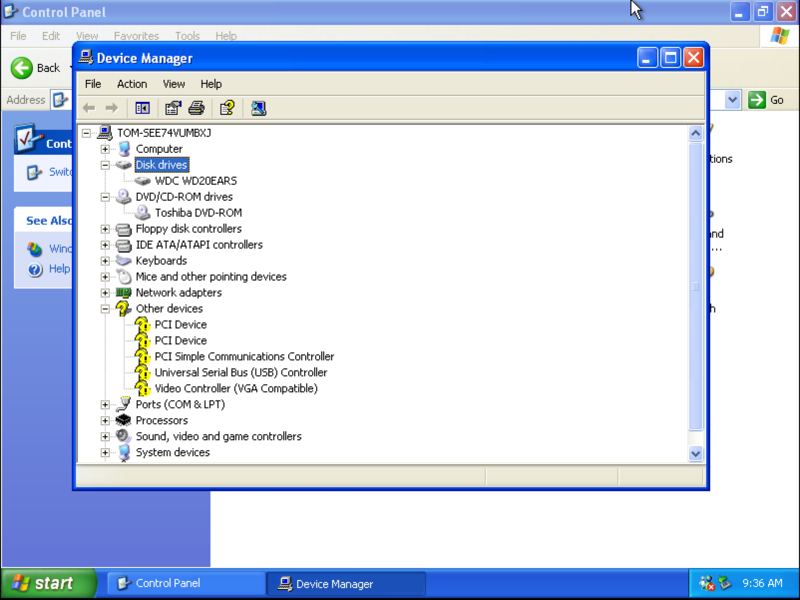 -smbios type=1,manufacturer="Dell" -smbios type=0,vendor="Dell" -smbios type=4,manufacturer="Dell" -smbios type=17,manufacturer="Dell" -smbios type=3,manufacturer="Dell"
You can also add the bios file using virsh edit and set the following. However, you still require the smbios arguments. You could also add the “-smbios type” parameters in the domain xml for the vm. This entry was posted in CentOS, KVM, malware analysis and tagged CentOS, Linux, malware on 2015-06-26 by david. One suggestion to remove the ‘hypervisor’ cpuid bit is to add ‘-cpu qemu64,-hypervisor’ to your qemu-kvm command line. Only need to work on the one cpu timestamp counter now.